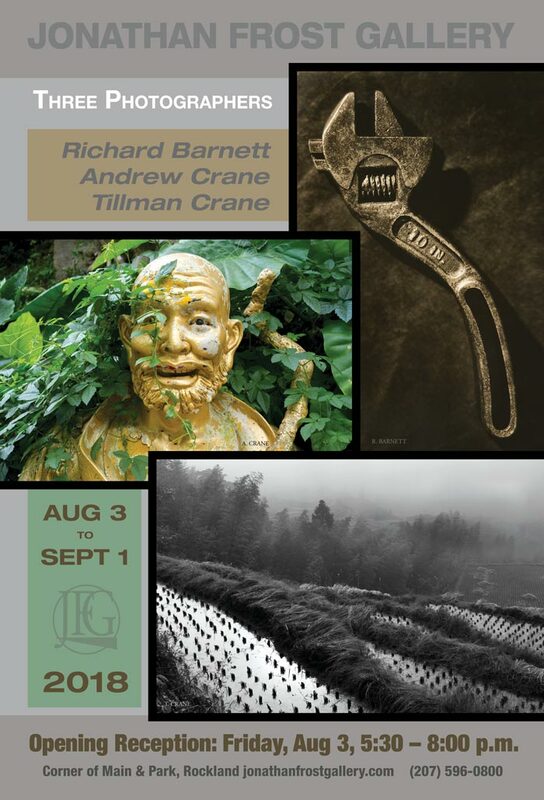 On Friday, August 3, from 5:30 to 8:00, the Jonathan Frost Gallery in Rockland will host the opening reception for a show of the work of three photographers: Richard Barnett, Andrew Crane, and Tillman Crane. All live in this area, and all use time-honored, hands-on darkroom techniques. Carl Root will play the piano at the opening. Tillman Crane, Andrew’s father, photographs quiet spaces in architecture and landscape. His photographic investigations have led him near and far, to the locks of the Erie Canal, the standing stones of the Orkney Islands, the banks of the Jordan River, and – six times – to China. He has produced large bodies of platinum prints, has shown extensively, and has published four limited-edition books. He has also long been a mentor to other photographers. Platinum prints are known for their archival stability and their unique look, with a matte surface and a more gradual range of greys than, say, silver gelatin prints. The show will be up through September 1. The Jonathan Frost Gallery is located at the corner of Main Street and Park Drive in Rockland. Hours are 10:00 to 5:00, Tuesday through Saturday. The phone number is 207-596-0800.